In science, denialism has been defined as the rejection of basic concepts that are undisputed and well-supported parts of the scientific consensus on a topic in favor of ideas that are both radical and controversial. … It has been proposed that the various forms of denialism have the common feature of the rejection of overwhelming evidence and the generation of a controversy through attempts to deny that a consensus exists. … A common example is Young Earth creationism and its dispute with the evolutionary theory. Millions of Americans are evangelical Christians. Climate scientist Katharine Hayhoe is persuading them that our planet is in peril. Few Americans question that smoking causes cancer. But they express bigger doubts as concepts that scientists consider to be truths get further from our own experiences and the present time … Americans have more skepticism than confidence in global warming, the age of the Earth and evolution and have the most trouble believing a Big Bang created the universe 13.8 billion years ago…. The poll highlights “the iron triangle of science, religion and politics,” … And scientists know they’ve got the shakiest leg in the triangle…. To the public “most often values and beliefs trump science” when they conflict, … … Political values were closely tied to views on science in the poll, with Democrats more apt than Republicans to express confidence in evolution, the Big Bang, the age of the Earth and climate change…. 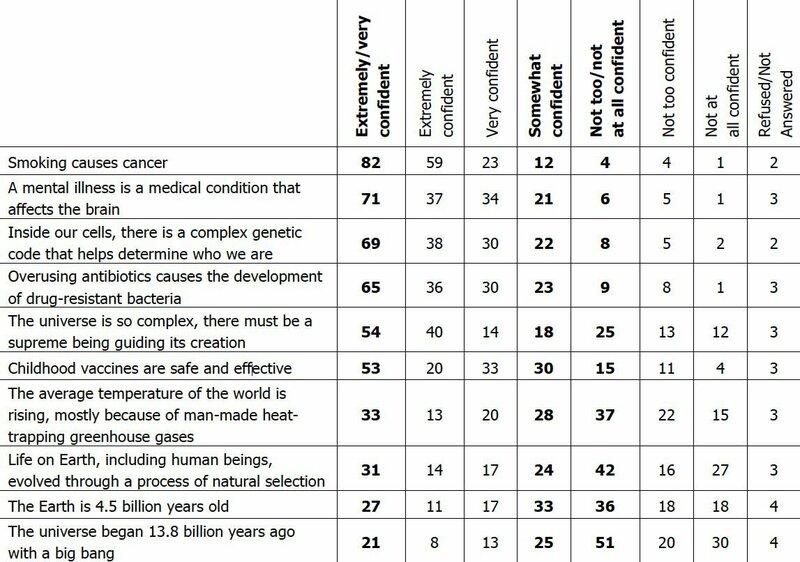 Experience and faith aren’t the only things affecting people’s views on science. … “the force of concerted campaigns to discredit scientific fact” as a more striking factor, citing significant interest groups – political, business and religious – campaigning against scientific truths on vaccines, climate change and evolution…. … sometimes science wins out even against well-financed and loud opposition, as with smoking. Widespread belief that smoking causes cancer “has come about because of very public, very focused public health campaigns,” … [also, what is very encouraging is] the public’s acceptance that mental illness is a brain disease, something few believed 25 years ago, before just such a campaign. Experts have come a long way in figuring out which messages can successfully open minds and move public opinion. There’s just one problem: They disagree about whether the message everyone’s using actually works. Uncertainty forms an integral part of climate science, and it is often used to argue against mitigative action. This article presents an analysis of uncertainty in climate sensitivity that is robust to a range of assumptions. We show that increasing uncertainty is necessarily associated with greater expected damages from warming, provided the function relating warming to damages is convex. This constraint is unaffected by subjective or cultural risk-perception factors, it is unlikely to be overcome by the discount rate, and it is independent of the presumed magnitude of climate sensitivity. The analysis also extends to “second-order” uncertainty; that is, situations in which experts disagree. Greater disagreement among experts increases the likelihood that the risk of exceeding a global temperature threshold is greater. Likewise, increasing uncertainty requires increasingly greater protective measures against sea level rise. This constraint derives directly from the statistical properties of extreme values. We conclude that any appeal to uncertainty compels a stronger, rather than weaker, concern about unabated warming than in the absence of uncertainty. In public debate surrounding climate change, scientific uncertainty is often cited in connection with arguments against mitigative action. This article examines the role of uncertainty about future climate change in determining the likely success or failure of mitigative action. We show by Monte Carlo simulation that greater uncertainty translates into a greater likelihood that mitigation efforts will fail to limit global warming to a target (e.g., 2 °C). The effect of uncertainty can be reduced by limiting greenhouse gas emissions. Taken together with the fact that greater uncertainty also increases the potential damages arising from unabated emissions (Lewandowsky et al. 2014), any appeal to uncertainty implies a stronger, rather than weaker, need to cut greenhouse gas emissions than in the absence of uncertainty. Although most experts agree that CO2 emissions are causing anthropogenic global warming (AGW), public concern has been declining. One reason for this decline is the ‘manufacture of doubt’ by political and vested interests, which often challenge the existence of the scientific consensus. The role of perceived consensus in shaping public opinion is therefore of considerable interest: in particular, it is unknown whether consensus determines people’s beliefs causally. It is also unclear whether perception of consensus can override people’s ‘worldviews’, which are known to foster rejection of AGW. Study 1 shows that acceptance of several scientific propositions-from HIV/AIDS to AGW-is captured by a common factor that is correlated with another factor that captures perceived scientific consensus. Study 2 reveals a causal role of perceived consensus by showing that acceptance of AGW increases when consensus is highlighted. Consensus information also neutralizes the effect of worldview. Citing several studies in moral psychology, the authors highlight the finding that despite differences in, or even an absence of, religious backgrounds, individuals show no difference in moral judgments for unfamiliar moral dilemmas. The research suggests that intuitive judgments of right and wrong seem to operate independently of explicit religious commitments. Perhaps this may help to explain the complex association between morality and religion. “It seems that in many cultures religious concepts and beliefs have become the standard way of conceptualizing moral intuitions. Although, as we discuss in our paper, this link is not a necessary one, many people have become so accustomed to using it, that criticism targeted at religion is experienced as a fundamental threat to our moral existence,” concludes Dr. Hauser. “U.S. Military Weapons Inscribed With Secret ‘Jesus’ Bible Codes” by Joseph Rhee, Tahman Bradley, Brian Ross (ABC News 2010.01.18) – http://abcnews.go.com/print?id=9575794.